The leadership mantle is often assumed to rest with the stallion in a herd, or an older mare, but is this really the case? A team of French researchers have examined herd movement dynamics in two groups of horses and struggled to identify behaviour that would point to a clear leader within either group. They did, however, find evidence of consensus in decision-making. Marie Bourjade and her colleagues based their findings on observations of the collective movement behaviour of two groups of endangered Przewalski’s horses housed in France in a 380-hectare enclosure in Le Villaret. The larger group comprised one 8-year-old adult stallion, five adult mares, two 2-year-old females and four foals. The other group, which was observed two years later, comprised a 12-year-old stallion, three adult mares and two foals. The groups were described as semi-free ranging. They lived without supplementary feeding or human intervention. Bourjade and her colleagues, writing in the open-access peer-reviewed journal, PLOS ONE, said leadership was commonly invoked when accounting for the co-ordination of group movements in animals, yet it remained loosely defined. In parallel, there was increased evidence of the sharing of group decisions by animals on the move. “How leadership integrates within this recent framework on collective decision-making is unclear,” they said. The research team set about examining the relevance of the three main definitions of leadership – departing first, walking in front travel position, and eliciting the joining of mates – within the two groups of horses. “We did not find any leader capable of driving most group movements or recruiting mates more quickly than others,” they reported. “Several group members often displayed pre-departure behaviours at the same time, and the simultaneous departure of several individuals was common. “We conclude that the decision-making process was shared by several group members [in] a group movement,” they reported, describing it as a partially shared consensus. This was at odds with the long-held conventional wisdom that the leadership role was held by the stallion or an older female, although they noted that some studies had come to different conclusions. The research team tested for potential relationships between the dominance rank of individuals and their tendency to lead within each group. Social hierarchies were assessed through observing aggressive interactions. The researchers found that five individuals in the bigger group were observed to depart first at least once, while no individual was found to depart first more often than expected by chance in the smaller group. When two or three horses departed at the same time, simultaneous departures were recorded. It represented 33 percent of all movements among the bigger group, and 19 percent of all movements in the smaller group. “We found no horse which could be qualified as the leader in the two groups of Przewalski horses, whatever the definition used to recognize leadership,” they concluded. “No individual consistently moved first, elicited faster joining by group members than other first movers, or consistently travelled in front position,” they said. They accepted that their results suffered from some limitations due to the limited number of groups observed. “For instance, it appeared that departing first and being in front during movement was more frequent with increasing age in the bigger group, but this was not the case in the smaller group. The researchers said the social structure in herds was always the same, and the family groups observed were representative of the typical social unit of horses living in natural conditions. 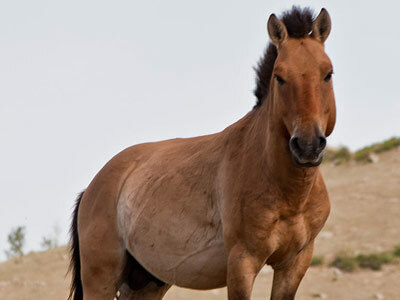 They would compare to other groups of Przewalski’s horses in terms of ecology and social organization. “It is therefore significant that neither the oldest mares, nor the stallions contributed more to the co-ordination of movements than any other horses did. The researchers said first movers did not display specific signals at departure and they did not attempt to influence the others in a coercive way. “This absence of motivational conflicts at the time of departure was confirmed by the fact that several individuals departed simultaneously on several occasions. It may indicate that decision-making had already occurred during the pre-departure period. Such evidence of shared decision-making suggested that traditional accounts of leadership, involving a single main individual, might not be the best way to describe group co-ordination or individual contributions to movement decisions, they said. Bourjade was joined in the research by Bernard Thierry, Martine Hausberger, and Odile Petit.